We're revisiting an old favorite around here for Valentine's Day. 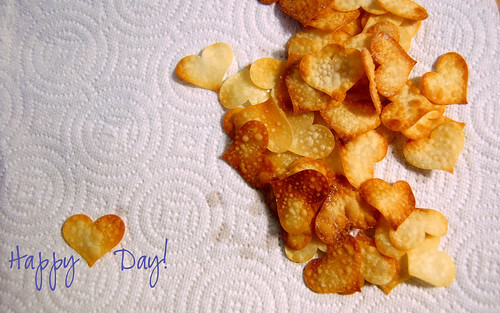 These heart-shaped Valentine crackers are a fun twist on what is seriously my absolute favorite snack, well maybe second only to "the best snack ever". These thin, crispy crackers are made from Wonton Wrappers, which you can almost always find in the produce section of your grocery store. 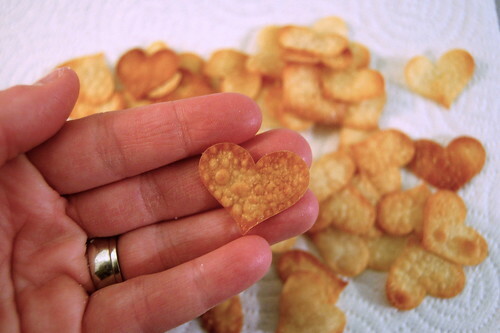 But in honor of Valentine's there must be heart-shaped crackers, people! The responsible part of me must tell you that these heart shapes can be made by simply pressing the shapes out of the un-baked wonton wraps. The recipe is absolutely simple, they only take a few minutes to bake, and if you manage to have any left, they keep pretty well in a ziploc baggie. Cut out heart shapes from crackers (or don't and leave as squares). Place a sheet of parchment on a cookie sheet and lightly brush the parchment with olive oil. Place wonton wrappers onto oiled parchement paper. Brush tops of crackers with olive and sprinkle with coarse salt, or any other tasty combination you'd like...sesame seeds, dill, rosemary, we've even sprinkled them with cinnamon sugar and stuck them in a bowl of ice cream. Yum! Bake the crackers in a 350 degree oven for approximately 3-5 minutes. You'll want to watch the crackers and pull them out as soon as they become golden brown. They can go from golden brown to dark brown very quickly, so keep an eye on them. Remove from the cookie sheet, snack on them and make another batch! Love this idea to use the hole punches!! Love this, I will be trying it and using my shamrock punch for St Patricks Day too!